Unfortunately, Google do not support PGP signatures or encryption for Gmail in their web interface or mobile apps. It looks like it might be possible to get some browser extensions but the best bet is to use an IMAP mail client that supports PGP (such as those listed above). Signing messages does not stop anyone reading the emails, it will just show if it's been altered since it was sent. In order to stop intercepted emails being read they will need to be encrypted. By default I'm not encrypting messages, just signing them. 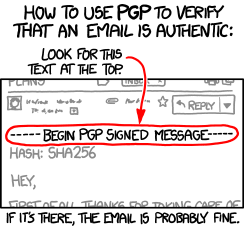 However, you can use PGP to send me encrypted emails. My public key is shown below, is listed on pool.sks-keyservers.net and I can provide you a copy on request.